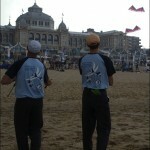 Once again kites shaded the beach of Scheveningen. 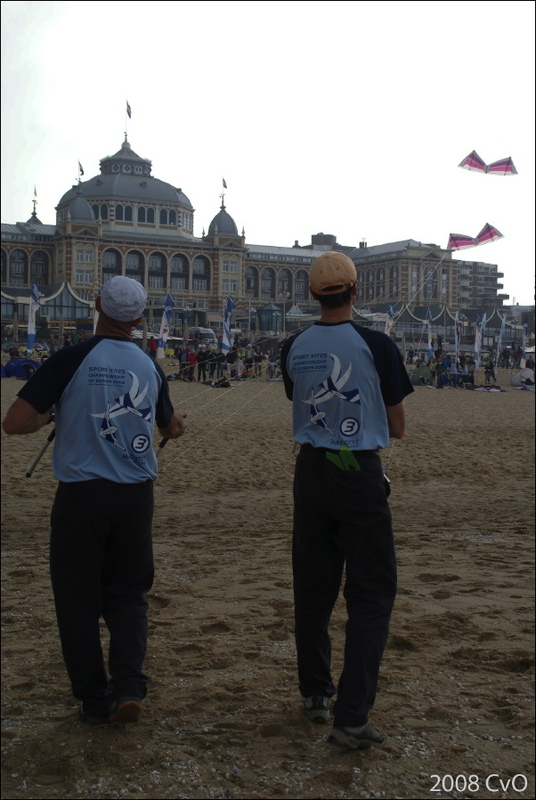 For the 30th time the old fisherman’s village, now the seaside resort of The Hague, welcomed many flyers from many countries, as well as ten thousands of kite enthusiasts around the fields and on the boulevards. The sport kite competition was held on friday and saturday, with the results and prizes being given out sunday, followed by demonstrations by all new champions. 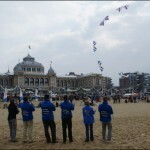 The kite festival was held on saturday and sunday. 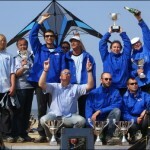 More than 60 pilots from 6 countries tried their best to become the European champions in 5 classes. 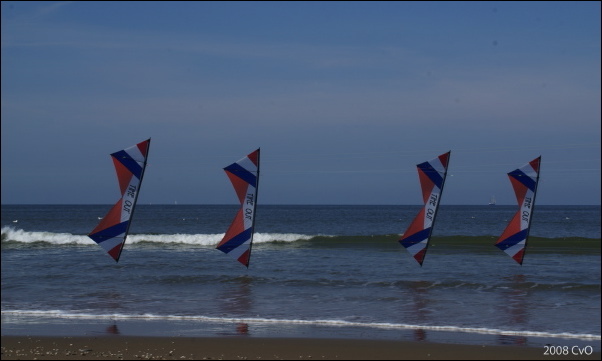 Even more than in the individual competition the pairs had to deal with light winds, making it very hard to show perfectly flown figures. And again it was no surprise the current champions did best, well as good as it got. Nuff und Under, a German pair, replacing the highest in German ranking, stayed close, probably helped by their trick party experience in light wind. 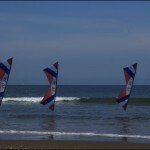 Their precision routine showed how tricks can be well combined into a “sport kite” routine. Wind picked up after these first disciplines, and turned a bit more to north. To avoid problems on saturday, for which even lighter winds were foreseen, the program was changed and as many disciplines as possible were to be flown. While on one field individual four line ballet started, teams flew their precision. 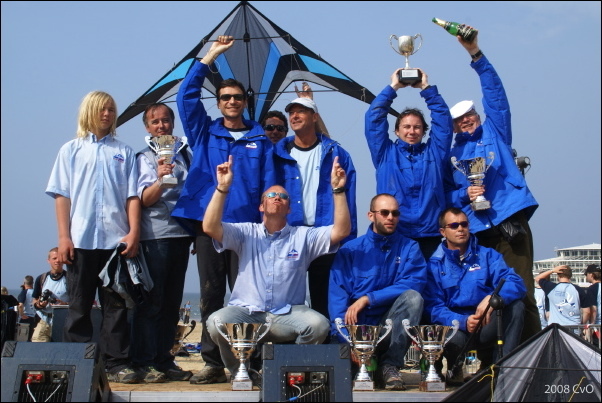 Unfortunately just four teams entered competition, a big difference with previous North Sea Cups held years ago on the same beach, where up to 15 entered! The three man team that won first price in Weifang this year could not compete since one of them lives in Australia, making practicing rather unpractical. In Germany no team competition has been held this year, and in Italy still lacks teams. The two top French teams did well, and stayed close. The four of the six Scratch Bunnies disappointed a bit, despite the experience in the team, and would have to do a very good ballet to reach first place. Wind grew stronger, into a good steady breeze and while some were still to fly the ballet part, other individual four line pilots started with the precision. Again experience showed, whether the more recent of the French as well as more “mature” of James Robertshaw. Current European champion Guido Maiocchi stayed close. They all flew Revolution(-like) kites. The symetrical, self designed and build kite of Steffen Sowade, who was first to fly, looked a bit strange compared to that “standard”. 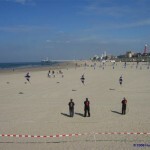 The figures selected ( MI04, MI07, MI16) did not favour one type over the other and Steffen used his kite well. The ballets of the individual four liners showed very different styles, and the top four of precision did best here too, although in a different order. It was (and is) clear new-comers have to work hard to beat these “old hands”. One of them, Marc van der Graaf from The Netherlands entered on a wild card. And the progress he made after just 14 months of training and competing suggests he might be a “threat” next time! In team ballet the Scratch Bunnies, flying last, showed their six man strength,. Although not as precise and clear as we have seen before from other teams, their ballet was impressive. The three man of Start-Air, who flew second, may not have been as impressive, but they did well and held their top position. First to fly O4 stayed behind, but not that much, so despite the fourth place here, still keeping their second place. Last class to fly on the day was pair four lines. Just two pairs, from France and Italy. (Sure there must be more pilots who like to fly together? And there is at least a third place for grabs..) They flew both precision and ballet in even nicer wind. Ballet showed a somewhat bigger difference than precision, the first position of Bruno Berthebaud and Phillipe Fontaine, ‘Quad a strophe’, though was not really threatened by Dissapair. With most people happy with the competition (and some less pleased with the results of course), and the judges tiered all went back to the hostel, a 15 min walk, to prepare for the next day. 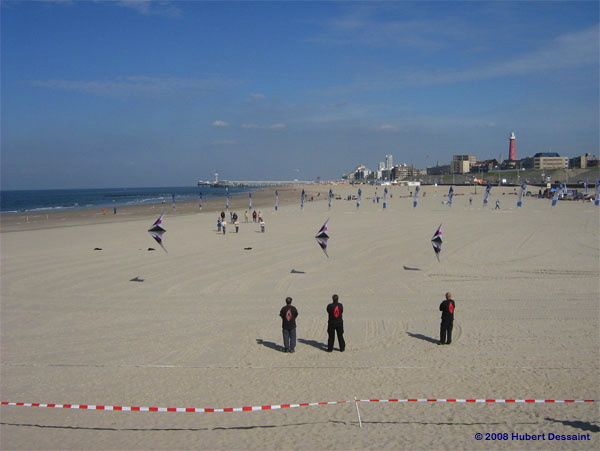 On saturday, also the first day of the festival, the competition field was layed out on the north side of the big Scheveningen pier. We started as late as possible with the two remaining disciplines, individual and pair two line ballet. 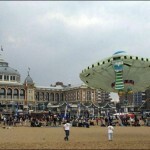 The east-north-east wind, not very strong, came over the buildings along the boulevard, causing nasty turbulence. Early afternoon direction changed to north-east, and speed grew to a good 8-10 km/h. A few thousand people ( the north side of the boulevard is always less crowded) watched the ballets. Opera and movie-music, rock and French chansons, combined with lots of tricks as well as a more “classical” style of ballet kept the interest of the public and got the applause it deserved! Richard Debray, defending his title, showed the -for him- usual combination of opera music and large range of tricks, performed so well it was clear his “defense” was working. Except that Chris Goff, who flew right after, demonstrated that that level of flying is not exclusive Debray’s! Last to fly Carl Robertshaw “attacked” Richard’s (or Chris’ ?) first place but came a few points short. Steff Ferme, flew his ballet as solidly as his four line ballet, but that brought him not further than fourth place. Stephen Versteegh, organiser of the championships, was a bit disappointed by his performance, his self-designed “Define” found the only shallow puddle on the field and took a dip. In the last discipline, pair two line, it was demonstrated again how many, well chosen and performed tricks fit (both meanings) a ballet, especially by Nuff und Under (Germany), Diesel (Great Britain) and Pairversion (France; who flew outside competition). Courant d’air proved that less can be more, they ended first in ballet too. Saturday evening it was time for a barbeque-diner for all involved in the championships and festival. Although nobody, except Andrew Taylor, the chief judge and I, as judge/scorer knew the results, it was -in general- a relaxed evening. A few people tried to find out how big the chances were for an all-French victory, rumor was that in that case the French national director Michel Durup, would go bungy-jumping at the end of the peer, from a special crane installed there. Of course we used every opportunity to add to his tension. Sunday one o’clock was the time to read out the results and give away the prizes, including the official “Euro cup”, a wisselbeker cup for two line teams. One by one class prizes went to French competitors, and after each cup we had to shelter because of the “sporty” way the champagne bottles were opened. 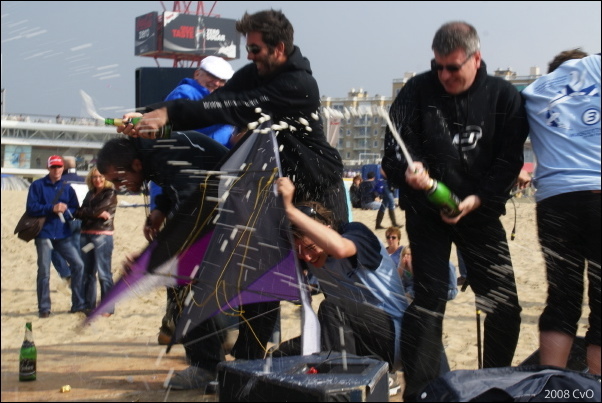 Ten thousands watched the “Flight of the Champions”, demonstrations after prize giving. 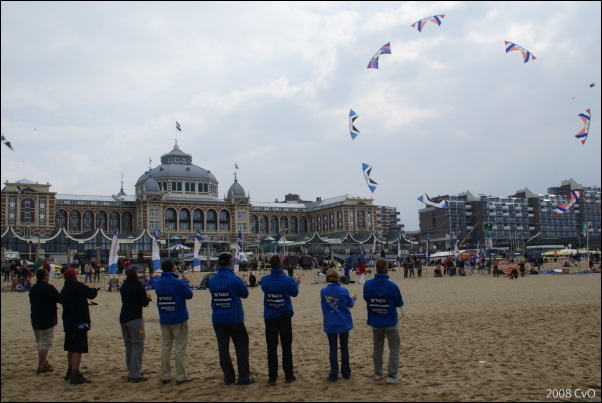 Of course others showed the public their kites and flying too! 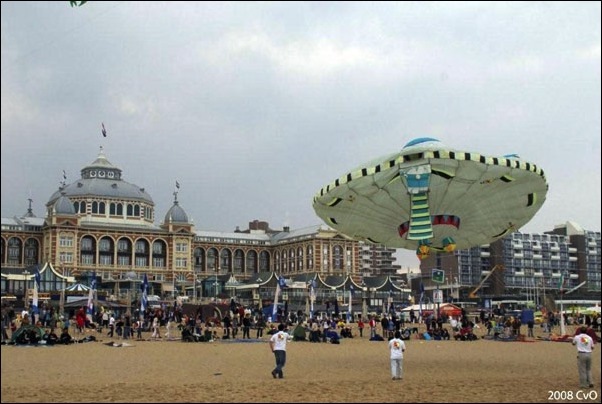 No doubt the Scheveningen festival will have a 31st edition next year, and a Euro cup too, some years from now. It would be nice to see more teams (both two and four lines) and four line pairs. A big thanks to Stephen Versteegh, initiator and organiser of this European Championships. This entry was posted in 2008, Competition, General Topics, Issue 62 (Sep/Oct), KL Archive and tagged championship, eurocup, Scratch Bunnies, time out.